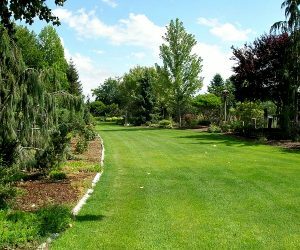 An oasis of trees, flowers and plants awaits visitors to the Bennett Botanical Gardens in Hermiston. Doug and Kris Bennett own and run one of Hermiston’s better-kept secrets: Bennett Botanical Gardens. Since the Bennetts moved to their residence on East Punkin Center Road in 1987, they have worked to make their land a beautiful and enjoyable place—first for their family, and then for others. The gardens take up five acres of land on the Bennetts’ property. Bennett says that when they first moved to the property, the only things growing there were a few large cottonwoods. They have planted evergreen conifers, deciduous trees, and perennial plants; and they plant new varieties every year. The gardens also contain various water features and other elements of visual interest. After the Bennetts hosted their daughter’s wedding in the garden in 2006, they began receiving requests to use their property as an event venue. The garden has since seen luncheons, dinners, receptions, garden clubs, educational tours, memorial celebrations of life, and many weddings. “It was never planned or purchased to do that; it just kind of evolved,” Bennett said. The gardens also serve to show how different plants survive in the Eastern Oregon climate and soil. Just your typical, ordinary flower bed. Homeowners in the region who want to know what will grow in their own gardens can also make appointments to look around the property. The Bennetts have gained much experience with these events despite the fact that they have done no real advertising for the gardens. “It’s pretty much been word of mouth,” Bennett said. She and her husband also make a point of supporting Hermiston-area businesses. “We try and steer people toward local hotels, local restaurants, local vendors,” she said. 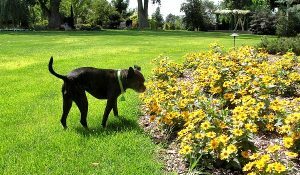 Bugs the dog takes a moment to stop and smell the flowers. Bennett says that, aside from new plant ideas, her husband is always thinking of new features to bring into the garden — particularly items made from natural or repurposed materials. Currently they are making old metal wine barrel rings into light fixtures, which they plan to hang from some of the large trees on the property: just another way that the Bennetts are working to make their gardens more enjoyable for visitors and for their own family. “If we can give inspiration and pleasure to people who come, that’s the biggest reward,” she said. Bennett Botanical Gardens is normally open for events May through October. Visits are by appointment only. The venue can accommodate 350 guests. Tables and chairs are available for rent. Kris Bennett also owns KRISanthemums, an organic floral design business. For information on Bennett Botanical Gardens or Bennett’s floral arrangements, call 541-571-2172 or visit the gardens’ website or Facebook page.